Gordon Willis, Cinematographer Who Gave Woody Allen Films Their Look, Dies : The Two-Way He shot eight films with Woody Allen and was particularly known for his work on dark films of the 1970s, such as the Godfather series. Wills was dubbed the "Prince of Darkness" for his use of shadows. 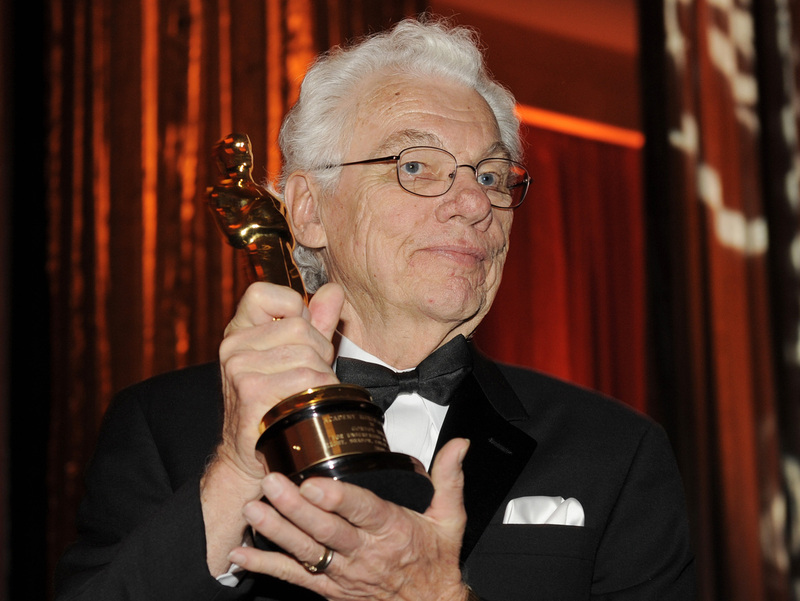 Cinematographer Gordon Willis poses with his honorary Oscar following a 2009 ceremony in Los Angeles. Gordon Willis, the cinematographer behind such classic 1970s films as Annie Hall, Klute, All the President's Men and the Godfather series, died on Sunday. He was 82. "One cinematographer had established a kind of noir color look, rich in brown, amber and shadow, that was a vital force in the noir movies made in Hollywood in the 1970s," film historian David Thomson wrote of Willis in his New Biographical Dictionary of Film. Willis won an honorary Academy Award in 2009, but never took home the prize for best cinematography. He was nominated twice, for The Godfather Part III and Zelig, but not for the earlier works that had established him as a giant among his peers. "For a while, I really didn't know what to do with that movie," he said of the original Godfather in a 2002 interview on NPR's Fresh Air. "I finally decided this should have this brassy, yellow look to it. Don't ask me why. It just felt right." The New York native got his start working in makeup. He worked on documentaries for a motion picture unit as part of his Air Force service during the Korean War. "He's an artist," Allen told People in 1983. "He's got a great sense of humor. He taught me a lot." Willis' last film was The Devil's Own in 1997, directed by Alan J. Pakula. "I got tired of trying to get actors out of trailers, and standing in the rain," Willis said.